View More In Moisturizing Gloves. All the people who have sensitive dry skin or cracked hands and the women who regularly wear high heel shoes. Do not dry clean, wash at temperature below 30 degrees. Do not use bleaching agent to wash. If possible use neutral soap. 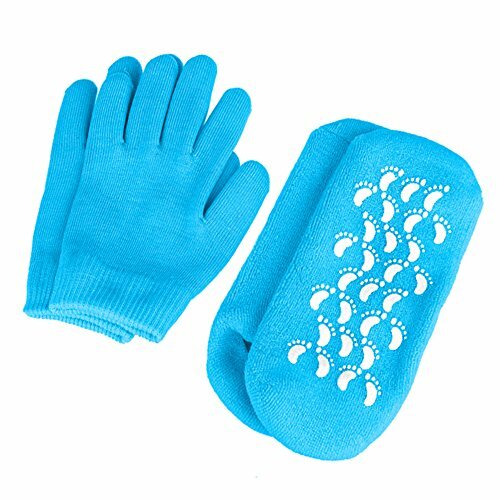 Soft cotton exterior and thermoplastic infused gel keep your hands breathable and warm. Moisturizing gloves and moisturizing socks are full of botanical oils, help restore beautiful soft skin with a daily moisturizing routine. Blue moisturizer gloves and socks can make a spa at home to enjoy the delightful fragrance of jojoba oil, olive oil and vitamin E.
Stretchable perfectly fits women and men, gel Moisturizing spa gloves and socks soft cotton with thermoplastic gel repair heal eczema cracked dry skin, gel lining infused with essential oils and vitamins. Please note that the gloves and socks have a thicker fragrance of essential oils.Use 20 to 30 minutes every day. Deep Care with Your Favorite Moisturizing Lotion. If you have any questions about this product by Noverlife, contact us by completing and submitting the form below. If you are looking for a specif part number, please include it with your message. Gloves In A Bottle Shielding Lotion 8oz w/Pump-A protective barrier against toxic chemicals, grease,oil,dirt, paint, wood stains & grime-for woodworkers, painters, construction workers, gardeners.